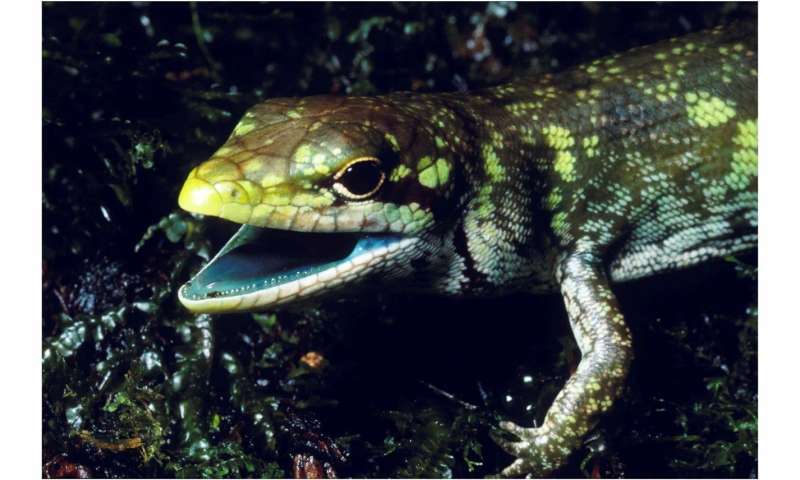 Prasinohaema prehensicauda is a green-blooded lizard with high concentrations of biliverdin, or a toxic green bile pigment, found in New Guinea. Credit: Chris Austin, LSU. Green blood is one of the most unusual characteristics in the animal kingdom, but it's the hallmark of a group of lizards in New Guinea. Prasinohaema are green-blooded skinks, or a type of lizard. The muscles, bones and tongues of these lizards appear bright, lime-green due to high levels of biliverdin, or a green bile pigment, which is toxic and causes jaundice. Surprisingly, these lizards remain healthy with levels of green bile that are 40 times higher than the lethal concentration in humans. "In addition to having the highest concentration of biliverdin recorded for any animal, these lizards have somehow evolved a resistance to bile pigment toxicity. Understanding the underlying physiological changes that have allowed these lizards to remain jaundice-free may translate to non-traditional approaches to specific health problems," said lead author Zachary Rodriguez, a doctoral candidate in LSU Department of Biological Sciences Professor Chris Austin's lab. Austin has spearheaded many expeditions to the megadiverse island of New Guinea to discover and document reptile and amphibian diversity. Rodriguez, Austin and colleagues investigated the evolutionary history of green blood, which evolved in several species of New Guinea lizards. They examined 51 species of skinks, which included six species with green blood, two of which are species new to science. They discovered that there are four separate lineages of green-blooded lizards, and each likely shared a red-blooded ancestor. "We were excited by the complex history of these animals and surprised by the breadth of green-blooded lineages across lizards," Rodriguez said. Their results will be published on May 16 in Science Advances. 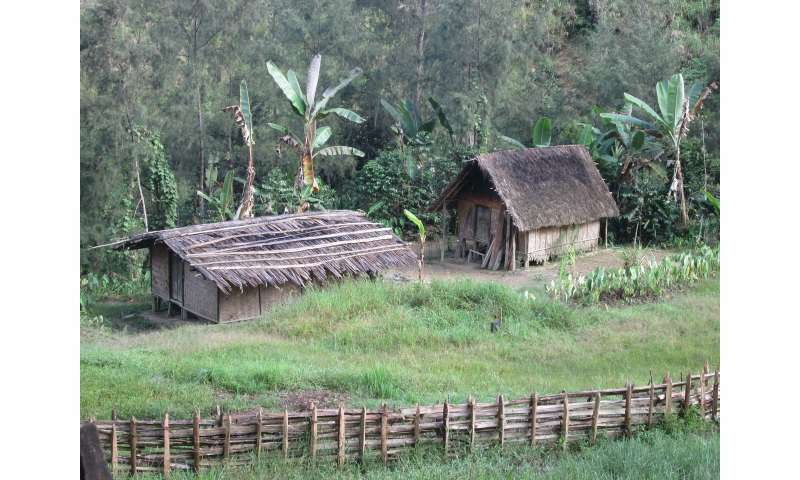 Field accommodations in Kaironk Village in the highlands of New Guinea's Madang province, which is at about 6,000 feet above sea level. With assistance from local peoples and the Papua New Guinea National Museum, field work in this area of Papua New Guinea has provided valuable tissue samples and voucher specimens for this research. Credit: Chris Austin, LSU. Green blood likely emerged independently in various lizards, which suggests that green blood may have an adaptive value. Slightly elevated levels of bile pigments in other animals, including insects, fish and frogs, have played potentially positive roles in these animals. Previous studies have shown that bile pigment can act as an antioxidant scavenging free radicals as well as preventing disease during in vitro fertilization. However, the function of green bile pigment in these lizards is still uncertain. "The green-blooded skinks of New Guinea are fascinating to me as a parasitologist because a similar liver product, bilirubin, is known to be toxic to human malaria parasites. Ongoing work with the Austin lab examines the potential effect of the green blood pigment on malaria and other parasites that infect these lizards," said co-author Susan Perkins, curator and professor at the Sackler Institute for Comparative Genomics and the Division of Invertebrate Zoology, American Museum of Natural History. 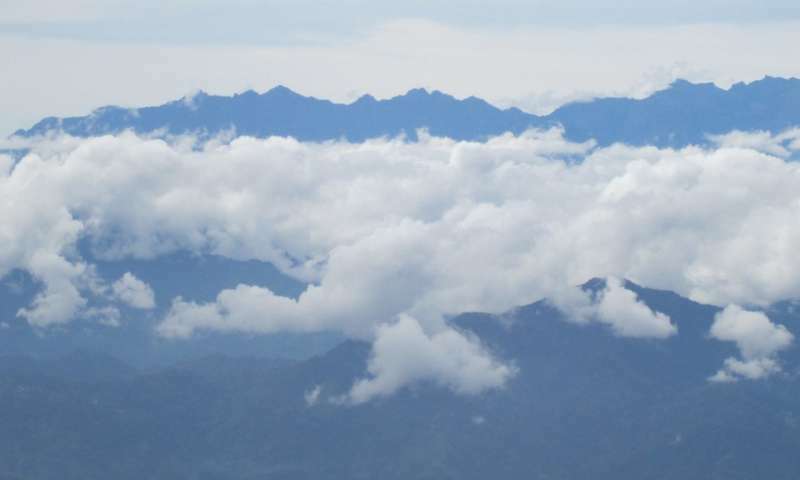 Mountains of the Madang Province Highlands in New Guinea where two species of green-blooded lizards live. Credit: Chris Austin, LSU. The scientists examined DNA samples from 27 green-blooded lizards and 92 closely related red-blooded lizards. They determined that red blood was the most likely ancestral state and that green blood likely evolved four times. "Our next goal is to identify the genes responsible for green blood," Rodriguez said. The story as told on NPR yesterday stated that one of the researchers ate one to test its taste and concluded that that wasn't the reason for its survival value. In other words it didn't taste as bad as it should have.